We’re lucky to live in a place like BC where the trees grow tall and the forests stretch beyond what the eye can see. Workability - Despite the structural strength of Douglas Fir, it is also an excellent wood when it comes to an overall workability. It is easy to work with using both hand and power tools, planes and cuts really well, it has a high resistance to splitting and has amazing nail and screw retention. Size - These trees grow tall, with the coastal variety reaching 85 meters tall (almost 280ft) and a couple meters in diameter. That means we have a lot to work with when custom cutting our timbers. It also means that we can get more lumber from less trees. Dries Well - Douglas Fir timbers dry at a quicker pace than some other wood species, and more importantly they are resistant to warping or twisting; these timbers also don’t “check” as much when they dry as other species. (Checking is when the wood grains start to dry, separate from each other and crack). Plus, unlike some other tree species, the Douglas Fir won’t leak or ooze nearly as much sap while drying. Non-Porous - The wood grain itself is non-porous, resists mildew and decay and is suitable for both exterior and interior applications. Takes Paint & Stains Well - Douglas Fir ranges in color from a yellow/orange-ish brown to a deeper redder brown, but because Douglas Fir takes paint or stains quite well, the timbers can be made to match your interior decor. There are other wood species we could use for our projects, but after looking at all the benefits of Douglas Fir, would you really settle for anything less when building your dream home? 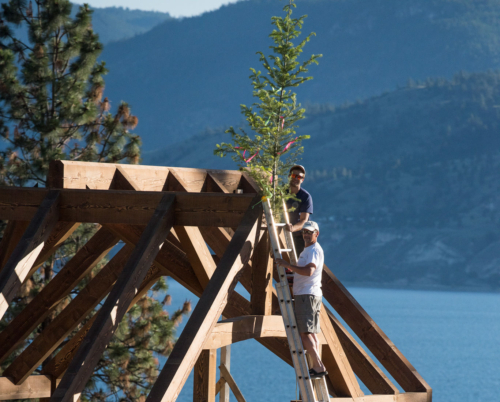 Neither would we, that’s why every European Timber Frame Corporation project is only made from BC grown Douglas Fir. 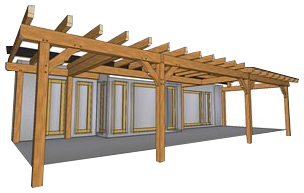 When you build the finest timber frame homes, you build them with the best timber possible. Would you like to see our Douglas Fir timbers in action?